The Society of Typographic Aficionados is pleased to announce that type designer, publisher and typographic pioneer Zuzana Licko has been honored with the 2013 SOTA Typography Award. 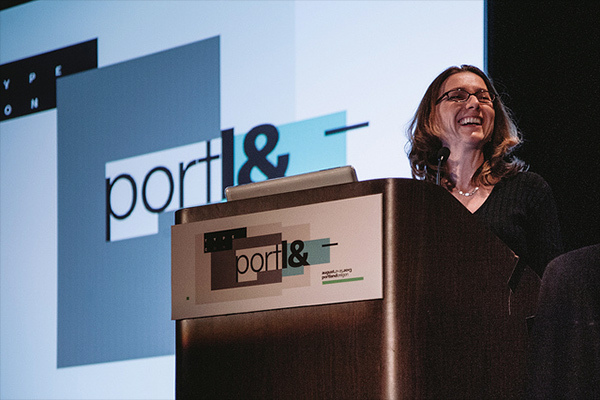 The presentation took place on Saturday, August 24th, 2013 at the Hilton Portland & Executive Tower as part of TypeCon2013. Chaired by board member Neil Summerour, the award jury included Nadine Chahine, Nicole Dotin, Indra Kupferschmid, John Boardley, Scott Boms, Stephen Rapp, and Xerxes Irani. Licko’s intellectual, highly-structured approach to type design, her trailblazing devotion to the development of digital type in context with legibility, layout and composition mixed with her unassuming and humble acknowledgment of her contributions to the industry made her a standout selection for SOTA’s 11th annual Typography Award. Each year, the SOTA Typography Award is presented to an outstanding member of the type community. Recipients of the award have included Hermann Zapf (2003), Ed Benguiat (2004), Matthew Carter (2005), Adrian Frutiger (2006), David Berlow (2007), Gerrit Noordzij (2008), Gerard Unger (2009), Doyald Young (2010), and Erik Spiekermann (2011), and Mike Parker (2012).